This delicious coleslaw makes a great accompaniment to fish tacos, or any kind of fish. Just make your fish tacos and add a spoonful of this on top of the fish. 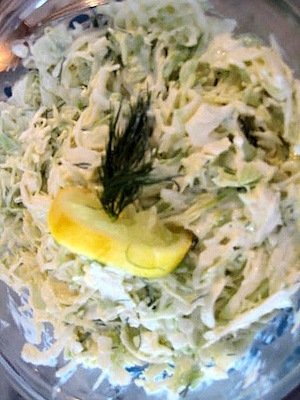 Mix the lemon juice and dill with the mayonnaise. Mix the mayonnaise into the cabbage. Add salt and pepper to taste. Chill until serving time.